Parent and baby classes are a perfect way for helping your child learn a key life skill. In these lessons, the sensory lighting is used to help children and creates a relaxing atmosphere. These lessons run throughout the Derby term time and last for half an hour. This is paired with SONOS surround sound, making the lessons more enjoyable for both parent and baby. The pool sits nice and warm at 32 degrees, which is the recommended temperature from Swim England. 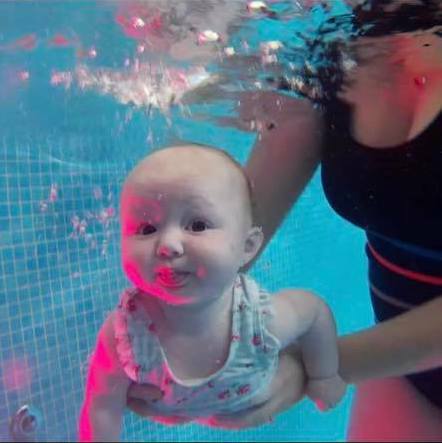 Sarah has had many years experience teaching these classes and has also completed Baby Swimming qualifications at Birthlight. We follow the Swim England Duckling Awards and more information about these can be found here. At SBSOS, we want to make sure that your child is learning life skills in a safe environment. To ensure this, we follow the PAS 520:2015 Code of Practice which has been recently developed by Swim England. This Code of Practice gives swim schools across the country, a high standard of practice which parents and carers can rely on, including safeguarding, pool safety and much more. When do the lessons run? Lessons are £12 each and paid for termly. For example, for a 6 week term this would be £72. If you were interested in booking or have any queries, please contact us. Due to the popularity of our lessons, we are currently taking a waiting list for our parent and baby lessons. When enquiring, if you let us know your preference in days and times, we will try our best to accommodate you.